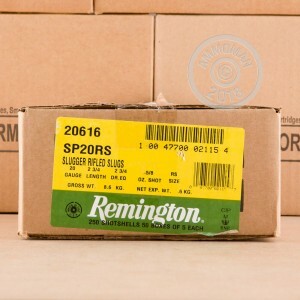 If you want affordable 20 gauge rifled slugs from a trusted ammunition manufacturer, then you have come to the right place. 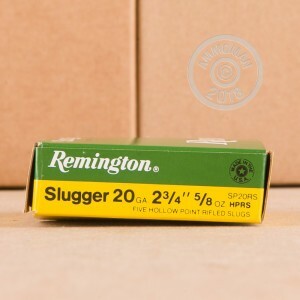 This 20 gauge rifled slug ammo, made by Remington, is perfect for your next medium game hunt. 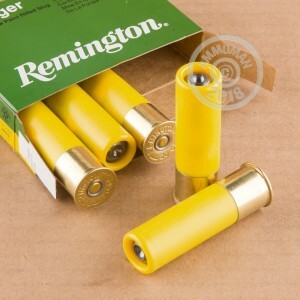 Remington Slugger ammo was designed for deer hunting, and to be able to reliably fire accurate, deadly shots. This ammo has a 5/8 ounce slug with a muzzle velocity of 1580 feet per second. This slug will provide a hard hitting strike, which is sure to drop any deer that gets hit in the vitals. Make sure you order enough of this great ammo to last the entire season. Remington has a long history of providing ammunition to American gun owners. Remington has also produced large qualities of small-arms ammunition for the U.S. military during its time as an ammunition manufacturer.